My baby is about 18 months old now, and is getting quite chatty. He’s saying “Bye-bye, Fafa(flowers)” and “Bye, Mama.” He’s trying so hard, I love it. 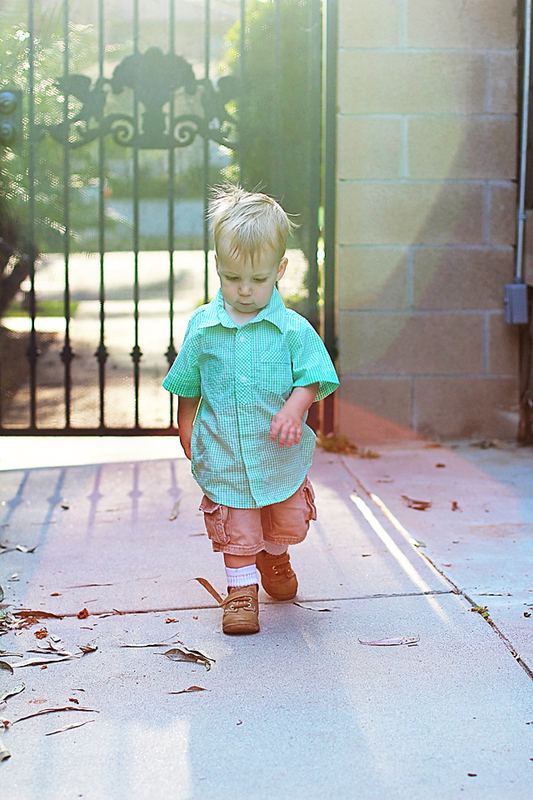 When we open the front door, he sticks his head out and yells, “Hi!” and he says, “Dada(Dog)… ooo ooo” (monkey sound. We lost the woof woof sound ). He’s always thinking about something. He loves pointing out birds, and cats in our yard (grr). I love that my baby grabs my face with a hand on each of my cheeks when he’s excited to tell me something. I can’t resist. Even when he’s covered in marinara sauce, and wants to grab my face for kisses. There’s no way I could turn down sweet baby kisses! This guy is so compassionate. Whenever someone is crying, he puts his hand on your head and says, “Uh suh(I’m sorry).” Even if he hears you from another room. He’ll come running in. He also says it if he even slightly bumps you. So sweet! We went to a friend’s house and he was enamored with their baby who was playing in an excer-saucer. He stood next to her, watching her, and leaned his face close to hers. Then he walked up to me and said, “Say hi,” then walked back to her. So cute! Last, but certainly not least, he is now a walker! About a month ago, he came out of physical therapy, and his PT knew I was in a hurry, but said, “You have to see this!” She put him on his bottom, then said, “Stand up!” He stood right up like he’d been doing it for ages! Before that, he would walk, and when he fell, he crawled to a wall or furniture to stand up. Now he has no need to crawl! Walka walka walka!